Online gift retailer Firebox has caused outcry with their latest gift release for the holiday season. Marketing a blue menthol candy as the distinctive blue crystal meth in the hit US TV show Breaking Bad, critics have argued that the online company are helping to trivialise drugs among youths. 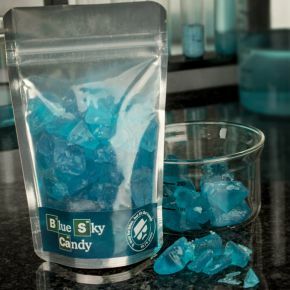 The sweets, dubbed Blue Sky Candy, are marketed on the website as the high grade crystal meth created by the Breaking Bad protagonist Heisnerberg, and even feature the actor Bryan Cranston on the page to market the sweets. Selling the bagged sweets for £7.99 the site claims "Coming at 99.1% we're manufacturing some serious weight, allowing us to offer the 4.5oz bags at street value." They do admit further down the page that, "This is NOT crystal Meth", but a spokeswoman for the drug abuse charity Cranstoun claims the sweets trivialise the drug to people who may not be aware of the consequences of the drug. She said: "The potential consequences of taking crystal meth can be horrendous and include severe psychosis, legions and rapid aging. "Trivialising this drug is irresponsible as it takes one further step to normalising what can be catastrophic substance abuse."